This formal but buffoon-like waiter creates havoc, mayhem and laughs galore. Either as a stage or strolling act, bringing his dinner diversions to parties for all sizes of events. 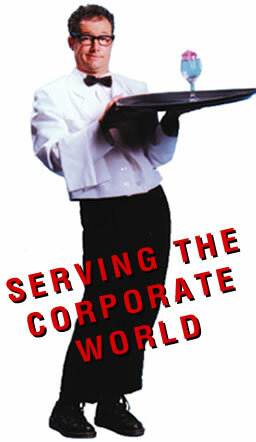 Awards banquets, cocktail hours, Christmas parties, corporate sales meetings, or any event that you want to produce fun and memorable times, The Wacky Waiter! is your guy! "Geist made his grand-entrance-our employees started laughing and never stopped! He's hilarious! I could not have picked better entertainment for our Employee Appreciation Day!"